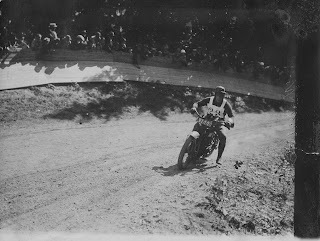 American Motorcycles Norway / Veteran-Mc.com: Motorcycle racing in the "Korketrekkeren"
Motorcycle racing in the "Korketrekkeren"
As mentioned in a previous post Korketrekkeren (corkscrew) was a very popular uphill race both for motorcycles and cars trough out twenties and well into the thirties. The motorcycle races held by NMK and KNA at this location drew speed dare-devils from all over Europe to compete on achieving the shortest time up the hill. Dangerous curves where banked by wooden planks to prevent the competitors from hitting the audience when they lost control of their bikes. In this picture from an album discovered in my last search for "pics from yesterdaze" a couple of visitiors from Sweden is captured at full speed up Korketrekkeren, though not fast enough as they are still far from climbing on the wooden planks as I have seen from my pics some did. Trough the years of competition taking place in the Korketrekkeren, race speeds where significantly increased. 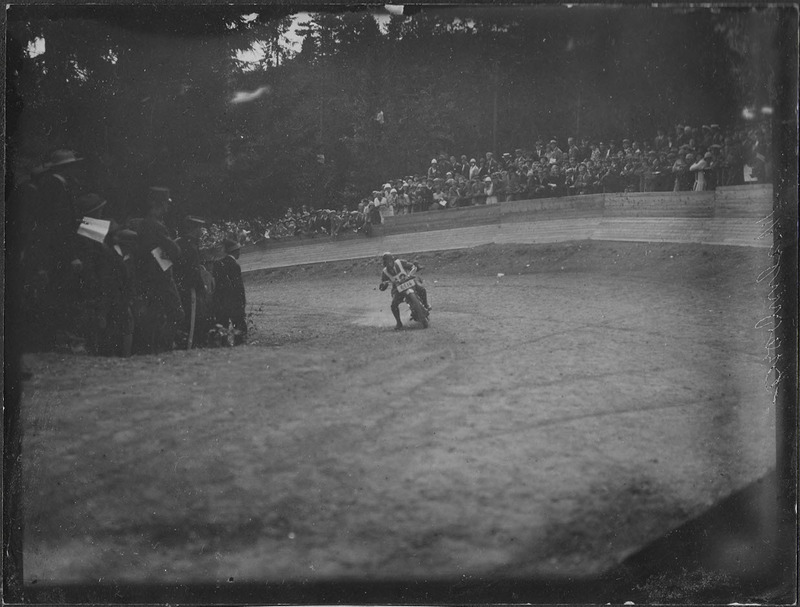 As stated in my first post covering the 1921 Korketrekkeren event, Macke Nicolaysen won by riding his Reading Standard at a time 2 minutes 59 1/2 seconds. 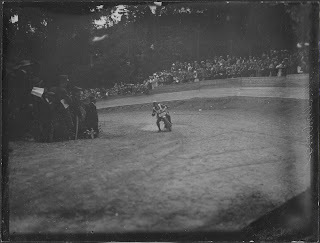 If we jump to 4 of June 1928 an international race was held in Korketrekkeren where "master" Erik Westerberg set a new record of 2 minutes 4,8 seconds and Norwegian Harley ace Ernst Vaumund clocked in at 2 minutes, 5 seconds. This is close to a minute less, whow! Its great fun to know the two Harley dare devils Erik and Ernst rode 10 sec faster up the hill than the Bugatti winning the race car class. This is cool! I have photos of my grand daddy Erling Gran Henriksen while racing Korketrekkeren, probably between 1920 - 1930!